The House of Jones: 30 Posts in 30 Days....DONE! 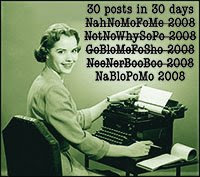 30 Posts in 30 Days....DONE! I must say I have really enjoyed the experience. Since I have only been in the blogging world since January, this is my first time to participate in NaBloPoMo. Although some posts were easy to make, there were a few fillers in there. But none the less, I did it. 30 posts in 30 days! Glad you joined me in this journey! I'm glad you did the challenge. I've enjoyed reading your posts (although, I'm a little behind, this is true!) Maybe it's that Twilight addiction!